that is such a hot pic...I kinda like the new style...the moose is cute! I too like the new style but I also like the old one. I would've liked to have some of the old style too. They only come in boxerbriefs. Abercrombie had briefs a LOOOOOOOONG time ago. But they fazed them out. That's what I feared they had done with the boxerbriefs, but really they were just remodeling them. I like both looks for different purposes. So I wish they had these and the old ones. 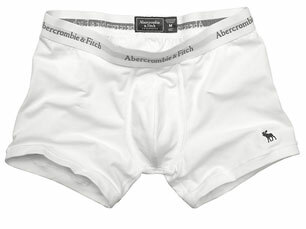 I actually still have a couple pairs of the old A&F briefs...they are so hot...too bad they had to get rid of them!! Chad - they didn't get rid of them. They just remade them. JR- Cool. I'm looking forward to that pic for our galleries (read previous post). The style is great...but what's with the boring choice of colors (white, black, and gray)? Tim - I agree the style is great. I think the reason they are only in those colors is because those are the basics and all the other stores that Abercrombie competes with have those same colors for their tight-fitting underwear. Abercrombie has a navy blue though too (I think). Frankly I think it is a matter of competition and I don't think that it would appeal to their audience to buy other colors. The color comes in in the boxer shorts. you know it could just be me, but I was unable to find any BRIEFS on A&F's website, so it would seem to me that they phazed them out???? Yes Chad, they did phase the briefs out. I just said that ;) But they didn't phase out boxerbriefs. and I was talking about the A&F briefs that I still have and you said they didn't phaze them out so I was a tad confused! Sorry chad. When you said briefs I thought you were referring to the boxerbriefs. Just to clarify everything. Briefs (as in legless men's underwear) were phased out a long time ago. Boxerbriefs (as in briefs but with legs) were just remade (I had thought they were phased out but they were just redoing them). Does that make it less confusing?